It is not one size fits all when it comes to welding helmets. Various welding helmets come with different features to meet your wants and needs. These features relate to visibility, lens size (viewing area), the weight of the helmet itself, durability, and comfort. Welders face many dangers including sparks and flames on the face and ultraviolet or gamma rays that can damage both skin and eyes. Considering welding may be dangerous without the proper equipment, finding the best welding helmet that is right for you is essential for your safety. Save Phace is a world leader in face protection and sells face shields, face mask, safety masks, paintball masks, military training masks, boating mask, sporting masks and, of course, welding helmets. To help you choose which helmet is right for you, below are four Save Phace helmets to consider. Bubba Down-N-Dirty Series Welding Mask 3.82 in x 1.85 in $ Check Amazon for Best Price! Chameleon Gen-X Series Welding Mask 23 Square Inches $ Check Amazon for Best Price! Murda Out Gen-Y Welding Helmet 23 Square Inches $$ Check Amazon for Best Price! MO2 RFP 40VizI2 Series Welding Helmet - $$$ Check Amazon for Best Price! 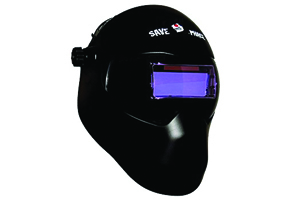 This sleek, black mask is equipped with a 4”x4” internal adjustable 4-9/13 auto-darkening filter (ADF) meaning you do not need to adjust the position of the welding helmet manually, thus saving you time and reducing risk to injury. 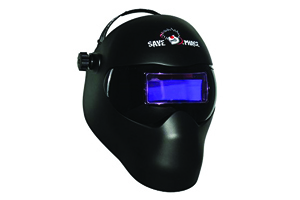 The Save Phace 3011124 Bubba Down-N-Dirty series welding mask comes complete with numerous controls including power, shade, sensitivity, delay, and grinding giving you full optimization during welding. Key features include a low battery warning and a power supply solar cell. Due to the face-forming profile, this helmet is great for situations where you may be welding in tight spaces such as under cars. Additionally, this helmet combines the features of a welding helmet, grinding mask, and splashguard all in one and provides 180-degree peripheral vision all at an unbeatable price. 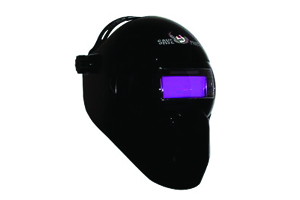 This professional quality mask is designed for the serious welder and is equipped with many great bells and whistles including an 180-degree ADF holder lens (shade #10). The Chameleon Gen-X Series welding mask provides an excellent viewing area with the world’s second largest at twenty-three square inches. This durable mask is made from high heat and high impact nylon making it the world’s lightest welding helmet at only 2 pounds. Goodbye neck strain! Not only does this helmet meet or exceed ANSI, CE, AUS/NZ And CSA standards, it also comes fully assembled and with 9 point high-quality adjustable Halo Headgear with replaceable sweat absorbent headband to keep you comfortable, a storage bag, and lens anchor set. If you are looking for a helmet that is comfortable to wear, the Murda Gen-Y welding helmet may be the answer. This lightweight helmet (less than twenty-four ounces) is the lightest welding helmet in the world. It has a face-forming profile allowing you to get into tighter spaces and the headgear adjustments allows you to move the helmet closer or farther away from your face. You’ll have ear-to-ear vision with this helmet since it offers the world’s second largest viewing area at twenty-three square inches. Additionally, the Murda Gen-Y is the world's first nylon welding helmet with an adjustable ADF integrated into a 180-degree lens design. Furthermore, the helmet has a 4/9-13 ADF that is completely adjustable in terms of the grind mode. Besides a two-year warranty, this strong helmet comes with a helmet bag, meets or exceeds ANSI, CE, AUS/NZ and CSA standards, and all parts are replaceable and interchangeable with other series making it the most versatile mask ever. If great viewing is your priority, this record-breaking helmet is for you. 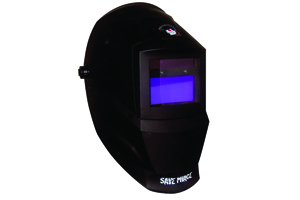 The Save Phace 3011612 MO2 RFP 40VizI2 series welding helmet has world's largest viewing area of over forty square inches. Additionally, it has the world's first and only 4"x4" ADF Integrated into an 180-degree welding lens! To top it off, this helmet has the world's fastest protective lens change system! Excellent airflow and a new articulating multipoint adjustable Halo Headgear makes wearing the helmet a comfortable experience--and it is lightweight at only twenty-three ounces. Besides being cheater lens compatible, the ADF features numerous internal adjustments, two sensors, is fully automatic, has a grind mode, and features various controls including those meant for sensitivity and delay. This low profile nylon helmet has a light state of shade 4 and a dark state of 9-13 depending on how one adjusts it. As a bonus, the helmet also comes with two flex fit front protective lenses and a two-year warranty on the ADF filter. This helmet also has a grind flash indicator and low battery warning.